Lauder was going to die. A long time ago he'd bought, modified heavily, and inserted an ocular implant that allowed him to function as a module designer despite a crushing depression. It sent him into a conceptualization of his own subconscious, where he could access memory patterns and, increasingly, take refuge. It had worked fine, until one day when it didn't. Everything functioned fine except for the subconscious gateway, which was closed off no matter what Lauder tried. Medicine had never worked; he felt it dulled his senses. Therapy was out; it had bored him and he'd always given up. The implant had been an engineer's solution, and had served him for a long time, leaving him without need to develop any other coping mechanisms. When it broke, the illness came in with a vengeance, and he saw absolutely no way out while it wrapped him in its black arms. And at some point - after he'd lost his job, his will to live and most of his basic dignity, living in his filth-ridden quarters on the space station he inhabited - he had a fever dream, wherein he realized that he was going to die and it couldn't be here. It would be giving truth to the path he'd always feared he was on, and would make lie of all those times where he'd told himself that he would be fine if only he went on just one more day. It'd be the last betrayal to himself, and it couldn't happen. He wanted to see something else, and be somewhere else, and feel that he was dying as someone else. It had to be a place that would fill him up, but not force him to be happy, because happiness would feel fake in his current mindset. A remote location, somewhere he'd never be found, but also somewhere beautiful and static, where he could rest his gaze on the surroundings without participating, giving of himself, or showing appreciation. Somewhere not created by man. He remembered surveys done on asteroid colonies, back in the days when he'd been working on module upgrades. One in particular had been renowned for its massive caves and even offered expensive zero-gravity spelunking tours, but had reportedly fallen into disuse in recent times: it was out of the way for regular traffic, and the colony on the other part of the asteroid was an unattractive place. The tours were still available, and although the suits were strapped into a set route with fiber wire, Lauder had brought some tools with him. He disabled his suit's remote positioning and callback systems, and in one of the food compartments he inserted a concoction that would make him drift off to a peaceful and final sleep. After taking care of the suit he had a talk with the tour guide, supplemented with a nice, two-part cash bribe. The guard, who was under the impression that Lauder was a rich thrill seeker, promised to let Lauder in there unmonitored and not worry about him finding his way back out in time, though he said he'd stay on shift for the remainder of the day in case Lauder needed any help. He added that there'd been other people who had wanted a bit of extra excitement when spelunking, but most had turned back the moment they went off the beaten path. 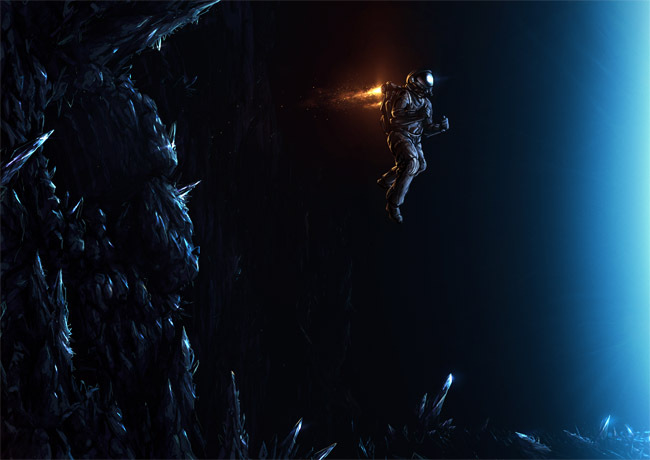 "Some parts of these caves are unstable, and when you cross over to weightlessness and dead space, it can affect you." "Some misguided need for self-preservation," Lauder said, adding, "Seeing as how they were strapped in, monitored and perfectly safe." "I suppose so," the guard said. "And sometimes the fear." "Whatever they'd find in there." The guard added that the cave inspectors, the ones who'd gone deepest into this complex of caverns, had usually not returned for a second trip, and that some said there was a natural maze in there. Lauder thanked him for the warning, strapped in, and set off towards the unknown. The starting area, called the Meadows, was pitch black. His suit had an illumination device that would let him see some distance ahead, but he didn't touch it and instead activated the night vision component of his optical implant. The world lit up. Lauder detached himself from the cable hooks that dotted the walls, and was soon free-floating in the cave, moving in deeper with the force of the tiny thrusters inset in his suit. It was a massive place, and it took Lauder several minutes of movement before he started seeing a hint of the opposite wall. To his surprise he noticed a few clusters of crystals dotting the black rock; he'd assumed the area had been thoroughly mined out before allowing casual tourists. Most of the crystals were greenish of color, with central spines that protruded far into space and smaller crystal fragments that stuck out at right angles from them. It seemed to him that one cluster of crystals was arranged in a fairly circular fashion around a rock that looked darker than its surroundings. As Lauder moved closer he saw it was an opening, leading to another section of the cave. He sped up, aimed towards it, and nearly knocked himself out when he crashed into the wall at full speed. Once he'd shaken off the blow, he reached out and started feeling the rock, wondering why he'd seen an opening there at all. With his depression set aside for a precious few moments, he inspected the wall, not only in his immediate surroundings but everywhere he could see. He thought he glimpsed a couple of other entrances, but they were gone when he blinked, and he wondered if his implant was conking out. He hoped it wasn't starting to transfer his mental constructs over to the real world; merely willing a tunnel into the wall shouldn't make his mind show him one. He let himself drift around, hovering over the crystals and looking for something else. Ever since he'd entered the Meadows he'd felt sure that he was on the right track, for whatever reason, and he refused to believe that he was supposed to end his journey and his life in the entryway. He eventually came to a blanket of crystals that seemed to cover impenetrable rock. He stared at them, and for a split second the world shifted, as if losing transmission, and showed a gaping hole behind the crystals. Lauder had no idea what was happening to his vision, but the thought of floating aimlessly here and staring at the crystals forever was too much to bear. He pushed himself away until he had a good starting distance, then used the suit's thrusters to reverse and speed him up, aiming for the wall. He'd picked up a fair amount of speed when he came close, and in the last second he pirouetted, hit the crystals feet first, and stomped on them as hard as he could. He'd assumed he'd be pushed away, but instead he plunged through, crystals shattering in zero-g all around him, and fell into a large, dark entryway to another cave. This one was less of a proper cavern than a long, vast alleyway, its surfaces beset with sharp, red crystals and with stalactites and stalagmites formed when this asteroid had been part of a planet's gravity. Lauder moved carefully through it, and idly thought that this dark corridor, with its edges and spikes and redness, was a fair representation of how he'd felt when the depression came flooding in. Also, his feet hurt. The corridor, which was wide enough to room a frigate, went on for a long while, turning occasionally in some direction but never coming to an end. Lauder had begun to wonder if he was judged to wander it forever, never leaving the flow, when he spotted an opening in the wall to his right and headed through it. He came into a cavern as big as the Meadows, full of massive boulders of worthless ore. Lauder felt very tired. He'd heard such stories about this place, and had felt inexorably drawn to it, and now all he had was a blackened hole no better for dying than his quarters. He looked around and gasped when he saw that the entrance he'd come through had crumbled soundlessly, leaving him with no option but to push on. He hovered over to one of the smaller boulders, which was the size of several men, with no aim other than perhaps to kick at it, but when he got closer, something didn't feel quite right. He turned on the light source of his suit and pointed it at the rock, and when he saw the red glint, he realized what he was seeing. Among the regular Omber and Pyrox he was seeing veins of Arkonor, one of the most precious ores in the world. He moved back and marveled at what he was seeing. There was enough Arkonor in this single boulder to make a planetbound man rich beyond his dreams. Lauder had worked enough with capsuleers to be set for life, so he let himself fantasize about someone else finding this cave, processing some of the ore, selling it and, somehow, finding happiness through the riches. It amazed him that in this nondescript cave, where he'd felt nothing but sorrow and lamentations, there could be something to change a person's life. After deliberating whether to inspect the other boulders, some of which were so tall that he could barely see where they ended, he decided not to, and instead floated gently among them, seeking another exit on this cave. There must be more than this, he thought. There was. He found a red-rimmed tunnel that led him back to the original vast hallway, with the red crystals on all sides, but it felt like a part he hadn't seen before. It was like he had traveled through the tributary of a river, and now he flew on, letting it carry him where it may. A flicker caught his attention, and he moved into another side tunnel. It led him to another cave, as big as the others, that looked as if he were back in winter times on a frozen planet. Everything was covered with ice, massive clear icicles that protruded from every surface like glass blades waiting for a giant's throat. Lauder noticed how some of them were remarkably similar to buildings; they were the same massive sizes as the boulders in the last room, but the structures here had tighter angles and clearer borders. Lauder marveled at it, but felt underwhelmed nonetheless. He'd been hoping for something more than ore and ice, but didn't know what, and felt an undercurrent of anger at himself for thinking so. Of course he'd find these things in asteroids, and little else. He was about to move on through when he remembered the flicker. He looked around, and saw something in the distance, but it was so refracted by the ice that he couldn't quite tell what it was. He moved closer, navigating among the frozen blades, until he rounded one of them and nearly had a heart attack as a massive ball of fire came towards him. He scrambled and jerked in mid-space, but the fire was extinguished before it reached his body. After catching his breath, Lauder realized that it had traveled alongside a gigantic spear of ice nearby, and had jumped off for a second before losing whatever fuel it had. He wondered if the fire was feeding off oxygen trapped in the ice, and whether the frozen liquid really was water, but nearby flickerings interrupted his train of thought. There was more fire here, writhing and burning, and it undulated over the ice like living danger. Without thinking, Lauder launched himself towards the fires, trying to catch them as they leapt off their surfaces. It was dangerous and stupid, he knew, and he kept going right until the point where he misjudged a leap and crashed back first into a large, jagged icicle, nearly impaling himself in the process. He managed to roll with the hit, but he heard, or felt, the vibrations on his body that felt half like his bones rubbing together and half like the suit being torn to pieces. The idea of losing everything to a stupid accident shocked him back to carefulness. He decided to leave the fire behind, and looked for an exit, still ignoring the fact that crystalline structures looked more and more like buildings every time he looked at them. It didn't take him too long to find his way back to the main hall, red and endless, though by then he'd accidentally broken some of the crystals and suspected he might have closed off access to this cave as well. He drifted on, lost in his own thoughts, and nearly missed another opening in the hall. He let himself drift through it, not knowing what to expect, and at first didn't see anything at all except a fuzzy cloud hovering in the cave. It took his eyes a moment to adjust, and when he realized what he was looking at, it took his breath away. The gigantic cloud was golden cytoserocin, its aurient shimmering beset with blue crystals that seemed to blink on and off. It wasn't merely the gas itself that stopped him short, but the fact that in its form it approximated some of the memory palaces he'd built for himself in older times. As it morphed and undulated it looked like bungalow, a wooden cabin in the murky swap, a castle with spires reaching towards the cavern ceiling, a series of promontories holding lighthouse spires, on and on and on. He came to a stop in front of the cloud, which was contained within its own static field in the cave. If there had been gravity, he would have fallen to his knees. It wasn't just his imagination, he was sure of it: He was seeing glimpses of the other world, the one he'd created. Every cave he'd gone through had brought it into sharper focus. He stared at the cloud in wonder. He'd forgotten so much. All these buildings and what they represented were gone, erased from his mind by the malfunctioning implant and the crushing grip of the depression. He felt like he was going to cry. After a long time catching his breath, Lauder turned away and left the cavern without looking back. Whether the structures had really been there, or if his implant was acting up, he didn't care. On his way out he kicked the red crystals as hard as he could, and they came loose along with a mass of rubble, sealing this cave off for good. His journey continued, hovering through the red corridor, for so long it felt like he'd traveled forever. He didn't mind that, not any longer. There was something here he hadn't expected, though he didn't understand what it was, nor even whether it was an external thing or merely the product of his own exhausted mind. And it all came to a crashing halt when he went through one last side entrance and saw, whole and untouched, his entire mnemonic world: every building he had ever conceived of, every pattern he had built, every single memory palace, all of them put together in this massive cave he had entered. He did cry now, felling silent tears that hovered in front of him before sticking to the inside of the suit, because he knew he had lost his mind. This could not possibly be here. The palaces stood in complete silence, crowded together like building blocks on a mat. They shimmered every now and then, turning almost translucent as the gas clouds had been in the other cave. As Lauder stared, he thought he saw a ripple go through them, and then before his eyes the buildings crumbled. Walls came down, windows exploded, dust billowed out in massive gales, and everything tore itself apart until there was nothing left in sight but rubble, rocks and fallen debris. It should have been like watching a representation of his depression at work, Lauder thought, but it wasn't; it felt cleansing, and rejuvenating for a reason he couldn't quite grasp. He looked down at the fragments below, lying there for miles around and held down by some ghost of gravity, and noticed that they were changing. From the grey cement rose glinting steel; bent wires undulated and writhed until they had become fiber filaments; and glass shards fused and liquefied, pouring themselves into just-born containers to become lenses and windows. From the debris rose these parts and came together, linking and connecting in front of Lauder's eyes, turning into something so familiar he could barely comprehend it at first. They hovered there in countless numbers, slowly matching up to form even more familiar shapes. In total silence, Lauder saw frigates created by the hundreds, designs from all races hovering side by side. Some of them seemed to explode without destruction, disassembling themselves, their constituent parts realigning with others to create larger vessels, cruisers now, battlecruisers, and even an entire battleship that hovered there in the middle like a rock in a river, the smaller ships orbiting and encircling it. Lauder floated towards the celestial ships, finally getting a sense for just how massive these caverns were, but the moment he hit one it disassembled, giving way like a pool of water. He expected it to have reassembled behind him, but when he looked back he saw that its parts were realigning themselves into something different, a structure he didn't immediately recognize. He glanced at the other ships and saw they were doing the same, but it didn't take long until he realized what was being created. In front of him, the nearest pieces were forming a side view of his own living quarters, down to the chairs and appliances. He looked around and saw that the quarters had been complemented by the entire machinery that usually surrounded them, and beyond it he could see other quarters, structural components, corridors and houses and processing plants, all the parts of the entirety of a space station that was assembling right in front of him. It began to dawn on him, in this heart of mechanical creation, that the deeper he'd gone into this place, the further he'd been led from the natural world of rocks, ice and gas, and had instead come closer to the intangible, the man-made and the world he'd known. Or, rather, he thought, the world he had formed for himself; the sphere of reference in which he had existed. That realization alone rendered it unimportant whether any of this was real, for it was no more or less real than his conception of it, and as he'd learned in being driven here, his conception of the world around him was everything. In all the ways that mattered, he had created this. And in his understanding of that, he also understood that it did not end here. It ended only when he felt it should end, and he had further to go still. He moved through this view of his life, and it gave way as he passed. Down through the tributary he went, into the red river, but this time it came to an end. The corridor narrowed down, the red crystals spiraling in on its final opening, a gate leading into somewhere unknown. Lauder hovered there at the threshold, unsure whether he dared go through. This suit would keep him alive for a long time, and he was afraid that if he went through and confronted whatever it was on the other side, he would die. He hadn't imagined he could possibly fear death any longer, but now he did. He wanted to go back into his old world, to the station where he lived, into the quarters where he spent his days, to stand in front of that plasma screen and look at the scenery until his eyes unfocused and he was back among the memory palaces he'd created. He knew he could do it. He had the ability, still, even if it was unreliable; these visions had proven that. But that same realization reminded him that now he had something at stake, and it was thanks solely to this journey. He had regained something he had thought lost. And he knew that if he were to turn back now, and give up his chance of finding the end of his quest, he would never forgive himself. It might be death, or something else; he didn't know. He pushed on through, resolving to find out. This cave was larger than all the rest, so big that he couldn't even see its distant walls. He had no idea longer whether what he saw was real - the cave itself might be miniscule for all he knew - but it didn't matter. He was engaging reality on more than one level. A light came on in what Lauder suspected was the center of the cavern, a white dot that seemed either tiny or distant. The dot started to grow, fast, its white light approaching Lauder at such high speed that he barely had time to think of how he wished it would not envelop him but would touch him instead; become part of him instead of remaining eternally distant. It got closer, infinitely closer, and Lauder reached out his hand in anticipation and dread. His fingers were outstretched, aching with the reach, and then the white light drew up and touched them. And the whole world changed. The cave lit up in all its glory, nearly blinding Lauder. The light, bone-white, made every detail visible in a hyperlit grayscale, and Lauder's first thought was that he had found God, some great force beyond normal existence. In front of him the space flickered, showing colorless images from the other caves. In the black and white of a flipbook drawing he saw the stalactites take form in the main hallway of the colony. The ore was created; it grew and bulged with the red veins, now grey in the blinding light, that would turn it to Arkonor. Liquid flowed through the asteroid while gravity still reigned, but its progress slowed and it started to freeze, aligning itself into gigantic crystals. It was pulled in several directions, with gravity clearly giving up on it, so it settled on every surface and kept freezing up. Lauder was surprised that there was no fire, and wondered where it would come from. At that thought the frozen icicles burst into grey flame, and Lauder realized with a shock that he was the one who had created this. The crystals exploded, their shards floating in mid-air and their flames enveloping them, seemingly baking the pieces until they turned into a shimmering black and white gas. The gas slowly dissipated, leaving various objects behind that were completely still, affixed in mid-air like asteroids in space. It was the pieces Lauder had seen in the last cave, where the ships and the station were created, but they were transparent now. There were rocks inside them, but they, too, were transparent, and as they began a slow trajectory to the walls of the cave, they began to deform, flattening and losing their shape, until they reached the rock and laminated themselves onto it, losing their definition and finally disappearing. And so the journey had come to a close, and Lauder understood what he was. This was a world of his own creation. The complex of caverns, which was certainly real, nevertheless existed on several levels, and one of them was inside him. In past times he had rebooted himself, flushing out the levels of his mind, and he understood that he had now done the same, facing and destroying everything he had built, things that were often inside him but nonetheless had not been part of him. He had trapped himself inside a world of his own creation, but he was separate from it, which meant that somewhere, there was a way out. With that realization, which left Lauder grinning like a nitwit, his optical implant stopped working for good, and the world was plunged into darkness. Lauder kept grinning. The suit had no functional night vision, but it had a focused light that would stay on as long as needed. He would find a way out. The suit had a lot of air, and had emergency rations that could be injected into him, so long as he stayed careful about that one cocktail of his own creation. He had time. It might not work, and he expected that if he ever looked back and saw the darkness he was leaving behind, the abyss would swallow him whole, but in that infinite road of time that stretched out before him, there was at least the faintest glimmer of hope.